From the makers of the Genuine Swiss Army Knife, the Mainframe delivers professional style for the business person. 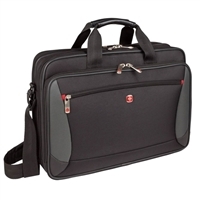 The heavily padded computer pocket provides protection for up to 16" widescreen laptops while there is an organizer for small items and plenty of space for files and gear. The Mainframe also has an internal pocket for your iPad, tablet, or eReader. 12" x 15.75" x 6"